Cupcakes 'n Daisies: Hill Country Baskets . . . .
All the baskets are pieced. I'm working on adding the sashing and connecting the blocks. I'm using Hemming House by Brannock & Patek for Moda. 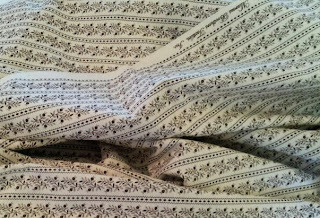 The sashing fabric is Civil War Backgrounds 1860 - 1865 from the collection of Judy Rothermel for Marcus Brothers. 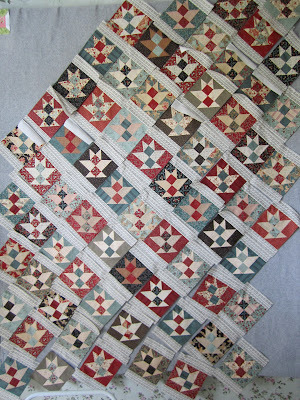 I fussy cut the sashing strips and had just enough for my quilt, not even 1 extra strip. For the cornerstones I'm going with a black print from the Little Gatherings collection by Primitive Gatherings for Moda. I ordered some yardage for the outer borders from ebay and it arrived just fine, thanks for all the tips. On an entirely subject, surprise! The quilt Judi Madsen, the Green Fairy, quilted won the Faculty Award at the Machine Quilters Expo in Portland. Wow a prizewinning quilt! 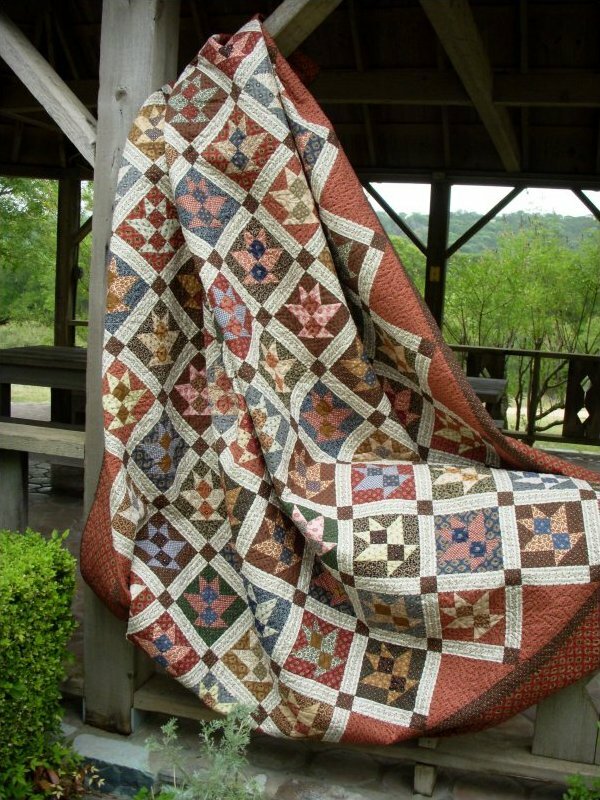 I have never seen quilting as exquisite as Judi Madsen's, so combined with your piecing I am not surprised it won. What happy news! Congratulations on your big win - I am still gobsmacked by the Judi's amazing quilting on that one. I have that pattern, but it is entirely spoiled for me now! congrats on the ribbon of course I want to see the full quilt again missy!!!!! Love you Hill Country Baskets! 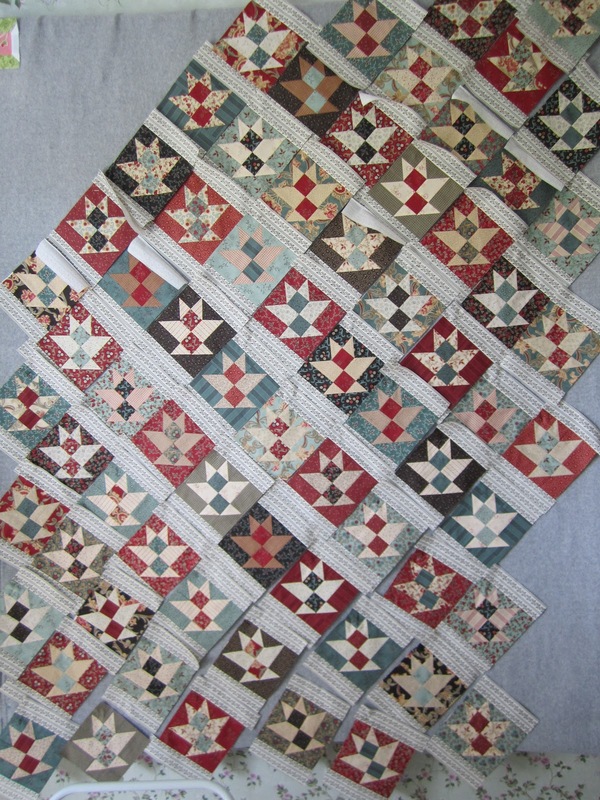 Not surprised that your quilt won a ribbon .... your fabric selection, piecing and Judi's quilting are amazing! I always love to see your current quilting projects and enjoy reading your thought process for each one. Thanks for sharing with us! Looking forward to a future post showing your finished Hill Country Baskets quilt! I really like that you tell us about the fabrics you used to construct this beauty! As for the ribbon winning Lifetime Quilt Number 62... how proud you should be! Would you please post another picture showing the entire quilt? Especially since she has returned home safely, after her adventures in Portland! Congratulations on your ribbon - does that mean you have had 62 quilts that were awarded ribbons? Very nice! Love the basket quilt and the sashing you used. What a neat idea. I like the Hemming House fabrics. I made a basket quilt with some of the same line of fabrics. Congratulations on the ribbon. To you and to Judi! You raised the bar with your fabric choices for Hill Country Baskets. congrats on the win. You and Judy are both deserving of it. Your basket quilt is looking amazing. Congratulations to you and to Judi, Thelma! The Machine Quilters Expo was in my own city this year but alas, I was out of town. I would love to have seen your quilt in person! Congratulations to both you and Judi! she does such beautiful work! it's amazing that she is self-taught. Your basket quilt looks so great! Congrats to both you and Judi for the great job you did! It's an amazing quilt! I'm head-over-heels in love with your Hill Country Baskets and can't wait to see it finished! They look like a lot of work! That quilt was certainly ribbon worthy! I remember when GF quilted it for you. It is just beautiful and I am so happy to see that it got the recognition that it deserved! Congratulations! Congrats on the win...what a pretty quilt! 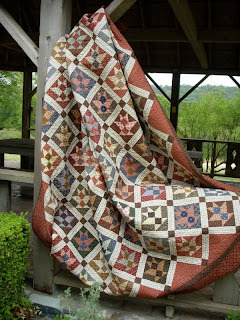 I love the Hill Country Basket quilt...the colors are heavenly!